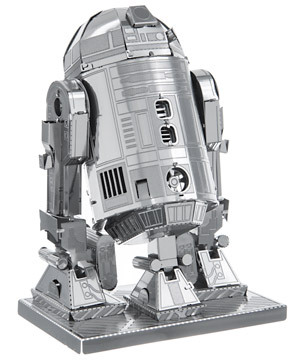 Star Wars Metal Earth Models are small-scale replicas of the machines from the ever-popular sci-fi franchise. Each model is made from a pair of completely flat laser-etched steel sheets. To build, pop out the pieces and then bend, fold, and assemble them together using the illustrated instructions as a guide. Metal Earth models require no special tools or glue thanks to their ingenious slot and tab design. 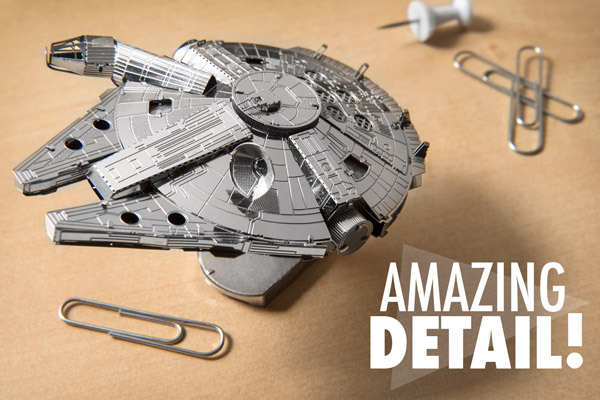 Because they're laser-etched, each palm-sized Star Wars 3D Model is stunningly detailed. 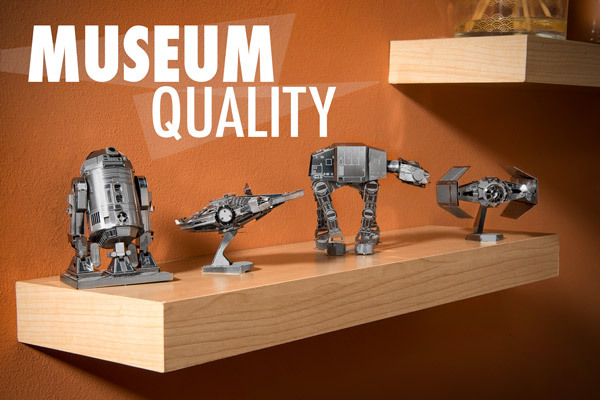 Choose from four models: TIE Fighter, R2-D2, Millennium Falcon, and AT-AT. 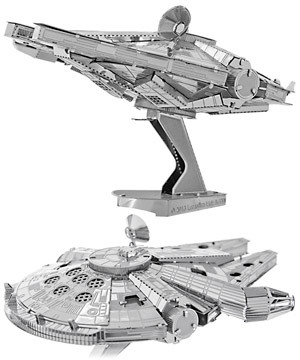 With Metal Earth 3D Model Kits, you can create realistic miniature models from the greatest sci-fi trilogy of all cinema. Each kit starts out as two completely flat metal sheets which have been laser-cut and laser-etched. Simply pop out the pieces and connect them using tabs and holes. 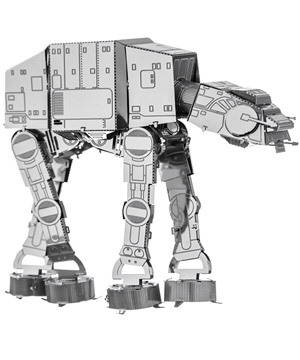 Transform a few sheets of laser-etched steel into 3D Star Wars models. Star Wars Metal Earth models are miniature in size only. The detail (thanks, lasers!) allows each model to take on a life of its own. They're truly spectacular! 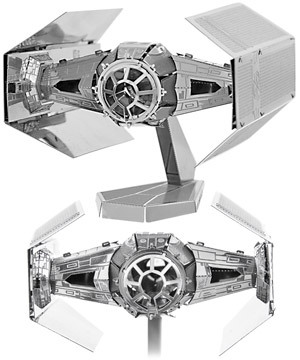 Despite their small size, Metal Earth Star Wars Models are bursting with detail. 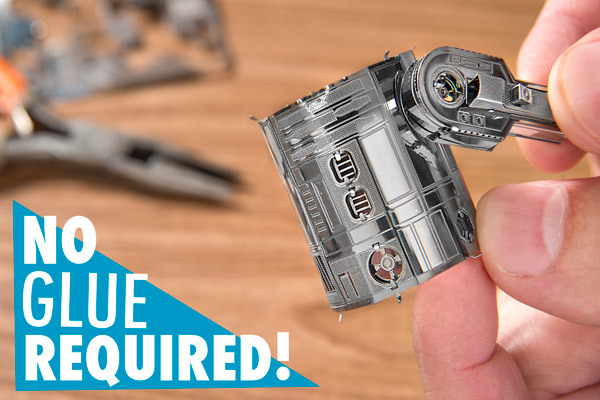 Assembling a Star Wars 3D Metal Model Kit requires no special tools, glue, or metal solder. However, we have found that a pair of pliers or tweezers can make precise assemblies a tad easier. In our experience, it'll take you a few hours to complete each model. Assembly requires no special tools. You may find a pair of pliers useful, however. Looks better than a carbonite Han Solo on your mantle! Take a gander at those beauts below! It's okay — you can go ahead and write home about these amazing museum quality models. Star Wars is awesome. So let the haters hate, and display your hand-made creations with pride! Collect all four officially licensed models! 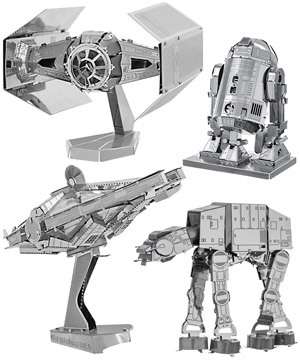 Star Wars Metal Earth models are currently available in four styles: Darth's TIE Fighter, Artoo, the Millennium Falcon, and the AT-AT. Expect to spend a few hours building each model. TIE Fighter 2 Moderate 2.5" x 2.25" x 1.75"
R2-D2 2 Moderate 2.5" x 2" x 3"
Millennium Falcon 2 Moderate 2.85" x 3.65" x 1.1"
AT-AT 2 Moderate 3" x 0.95" x 2.75"
Star Wars 3D Metal Model Kits are available in four styles. Question: Do the completed models move? Answer: No, the models are for display purposes. Incidentally, they look great atop a Levitron. Question: Exactly how long will they take to build? Answer: Depending on your model-building skill, it could take you several hours. Each of the two-sheet Star Wars models are of equal difficulty. 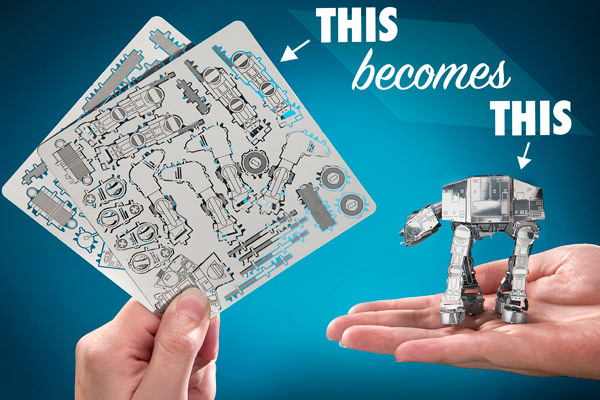 If you're looking for something easier, a few of our other Metal Earth models are made from only one sheet of steel. Question: What is the recommended age? Answer: The manufacturer recommends solo builders be ages 14+. However, younger children could build these models with adult assistance.